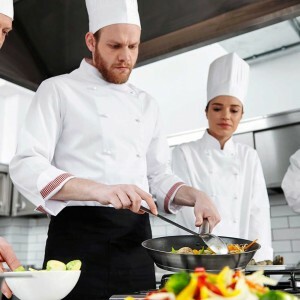 Consider These Aspects Before You Choose Your Restaurant’s Employee Uniforms | Ace Uniform Services, Inc. There is a lot to consider when choosing your restaurant employee uniforms. The restaurant industry is a tough one to be in. There is typically a lot of competition and because they require so much work to run, you may feel like you are always on the clock. If you are opening your own restaurant you have plenty of difficult decisions that you need to make. You will need to decide on the floor layout, the type furniture, the menu, and several other aspects. One decision that should also be given a lot of thought is the employee uniforms. The typical black and white waiter uniform is incredibly outdated and boring. If you want your restaurant to have a modern feel, incorporate some color into your employee uniforms. If your restaurant’s logo is bright red, you should consider designing uniforms with the same color. Don’t shy away from bright and bold colors because people really seem to like it. Nowadays, company branding is extremely important. With that said, you should always have your restaurant’s logo clearly visible on your employee uniforms. If you are trying to decide where to put it, the back of waiters shirts is a great place. Why not incorporate some stylish accessories with your employee uniforms? Nowadays, it is not uncommon to see restaurant employees wearing hats, jewelry, scarves, vests, etc. Depending on the formality of your restaurant, there are all sorts of things you incorporate into your employee uniforms. This entry was posted on Friday, June 23rd, 2017	at 9:55 am	. You can follow any responses to this entry through the RSS 2.0	feed. Both comments and pings are currently closed.